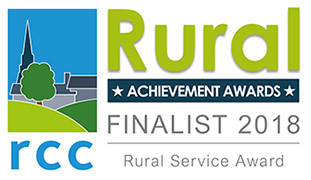 Our Rutland Neighbourhood App has been shortlisted in one of the six main categories called ‘Rural Service Award’, with the overall winners of each category to be revealed at a celebration dinner to be held from 7pm on Thursday 11th October at Winstanley House in Leicester. Tickets available here. Rutland Neighbourhood Watch (RNHW) is a network of approximately 100 autonomous ‘Watches’ (all voluntary), of varying size, whose joint mission is ‘to Unite the community against crime’. Driven by the fact that Neighbourhood Watch had become dated and lacked relevance to modern technology-based lifestyles two retired volunteers put in12 months hard unpaid work to develop a smartphone and tablet app providing everyone (not just NHW members) with a ‘one stop shop’ for Rutland living. Available free from Google and Apple app stores the app provides police alerts, local news, traffic and weather updates, crime prevention information, and details of local services (Council, Doctors, Dentists, Vets, Transport etc). Remaining true to its origins, the app also provides over 1300 users with fast links to the Emergency Services and support services for victims of crime (Victim Support, Domestic Violence, Childline, etc).